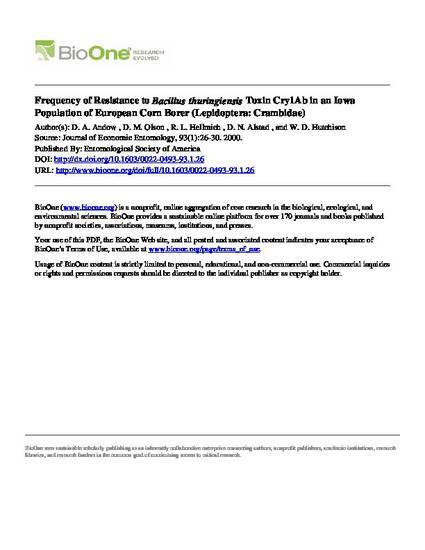 The refuge plus high-dose strategy for resistance management assumes that the frequency of resistance alleles is low. We used an F2 screen to estimate the frequency of resistance to transgenic corn that produces Bacillus thuringiensis Berliner Cry1Ab toxin (Bt corn) in an Iowa population of European corn borer, Ostrinia nubilalis (Hu¨ bner). We also proposed a modiÞcation to the statistical analysis of the F2 screen that extends its application for nonuniform prior distributions and for repeated sampling of a single population. Based on a sample of 188 isofemale lines derived from females caught at light traps during the 2nd ßight of 1997, we show with 95% conÞdence that the frequency of resistance to Bt corn was ,3.9 3 1023 in this Iowa population. These results provide weak evidence that the refuge plus high-dose strategy may be effective for managing resistance in O. nubilalis to Bt corn. Partial resistance to Cry1Ab toxin was found commonly. The 95% CI for the frequency of partial resistance were [8.231024, 9.431023] for the Iowa population. Variable costs of the method were $14.90 per isofemale line, which was a reduction of 25% compared with our initial estimate.